The US cash rate reached 1.75% in March; the first time the US cash rate has been higher than the RBA’s since 2001. Developed world economies have mainly returned to, or close to, pre GFC employment highs. For example, the US, Japan, Canada, New Zealand, Germany, UK and Australia are now close to full employment. An increase in wages growth of 2.1% in Australia and 2.9% in the US point to a return of inflation. As Star-Wars fans know, ‘the force’ must always exist in balance. The same is true in economics, “And balance, we have not had, for some time” [said with your best Yoda voice]. A splurge of free money, via quantitative easing, has resulted in an asset price boom, with little evidence it made a significant contribution to economic stimulation. It’s been a long slog since the GFC, but towards the back end of 2017, and for the first quarter of 2018, we’ve seen widespread global growth across developed and developing economies. The employment needed to fuel this growth is approaching pre-2008 saturation levels. The prospect of ‘full employment’ in many developed economies is a real possibility. As we approach full employment, labour market competition drives up wage growth. Where wage growth goes, inflation follows. Green shoots are already appearing in the US, posting 2.9% wage growth for the year to Jan 2018. The trend has been a continuous rise from 2013. An expected return of inflation marks the end of ‘free money’. Inflationary pressure gives cause for central banks to cease printing money and begin to tighten or consider tightening monetary policy (increase interest rates). It should be noted that presently inflation remains near record lows in most economies, so the timing and impact of any changes is not an immediate concern, but one to begin factoring in. Rising interest rates producing an increase in the cash and floating rate income yields make investment in cash products more favourable. As this happens we expect to see some capital move out of equities into more attractive ‘risk-adjusted’ investment opportunities. This movement of capital will be associated with market volatility, some of which we have already seen in early 2018. Much like a Skywalker paternity test, there is a twisted irony in markets. An improving economy should translate into higher equity market prices and yet, as the above graph demonstrates, this is not what is happening. As economic fundamentals improve, so too does the prospect of an increase in the cash rate. As the cash rate rises from such a historically low base, even a small increase has a large impact on the discounted valuation of future earnings. Given the elevated valuation multiples some businesses trade at, caused by historically low interest rates, the negative impact of a higher discounting cash rate is more significant than the positive impact of improving economic conditions, particularly for low growth investments. Here-in lies the economic plot twist. This odd inverse correlation between economic performance and the investment performance of sectors of the market is one of the unintended consequences of an untested quantitative easing policy. As the graph above demonstrates, when strong US wage growth surprised the market in February, the market had a strong negative pullback. The effect of wage growth, and its inflationary flow-on, has on markets is more pronounced than even the initial trade war volatility. Why is this happening? Quantitative easing incentivising cheap money to flow into income producing assets, inflating their value well ahead of the economic improvement. As the economy finally catches up, there is little scope for further capital growth while interest rates are normalising (read increase). “Bond proxy” equity businesses trading at elevated P/E ratios, as well as yield focussed property exposure are on the lightsabre chopping block. (I.e. That is yield focussed, low growth businesses like Telstra, big banks, infrastructure, Woolworths and Wesfarmers are no longer as attractive investments as they were). 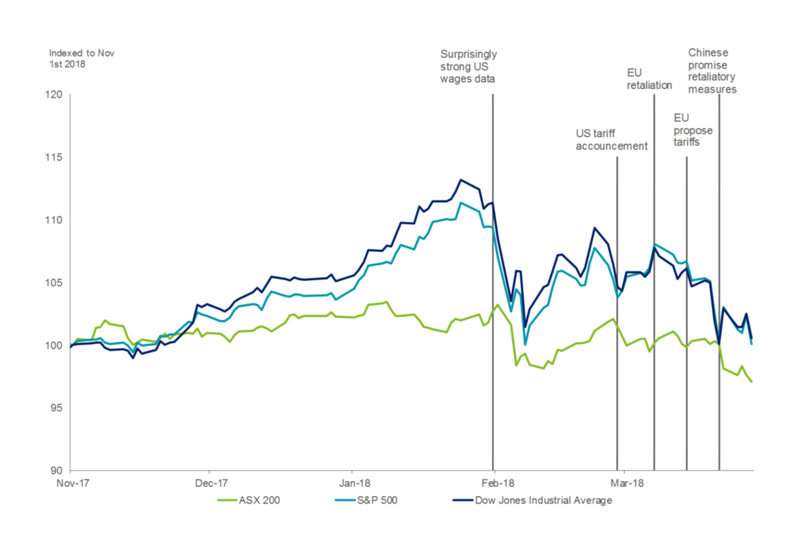 Australia is behind the US on wage growth and we think wage growth will be, in Australia, the most significant influencer on domestic markets in 2018 and early 2019. Unemployment has remained constant at 5.5% for approximately 12 months, with a small increase in the participation rate. With stable growth and baby-boomers increasingly retiring, demand for good employees should be stimulatory for wage growth. The US Fed has signalled a further three rate rises. This increases wholesale funding costs for banks, with the US 10-year bond rate now higher than the Aussie 10-year bond rate for the first time in 20 years. This indirect monetary tightening effect further supports the need to see wage growth before RBA monetary policy changes are expected. If wage growth, particularly for higher skilled workers increases, keep one eye on inflation. We’ve been trimming client exposures to longer fixed interest positions, as opposed to shorter or floating rate interest positions, and are cautious about investing in mature domestically focussed income orientated equity businesses. We’ve gone a dozen paragraphs without mentioning Trump - alas he is worthy of a mention. He is the Jar Jar Binks of the economic landscape. In a bizarre twist, the character everyone hates, who is afforded far too much screen time, is now somehow in charge of the largest fiscal policy agenda in the Republic world. The US finds itself in the most positive economic environment it has been in for over a decade and ‘Jar Jar’ has decided now is the time to take an even looser approach to fiscal policy? That is, more government spending, less taxation. A contrarian approach to be sure!! To question government debt is to be labelled a fiscal conservative, but even in our limited capacity, some boring fundamental cashflow realities see our business happily labelled fiscal conservatives. We don’t understand how there isn’t greater focus on the US digging itself into a hole over the longer-term. A great mantra to live by is the saying “if there is an elephant in the room, introduce it”. Uncomfortable issues don’t go away just because we don’t talk about them. This lecture from Randy Pausch refers to this saying and is a great example of this. The largest elephant casting its shadow across the economic landscape, we believe, is US public debt. The Elephant grows fatter each year and is often ignored by economic and media pundits alike. There are other economies with greater public debt, but none are as important as the US. Trump displays the budget discipline of a spoilt toddler in a candy store. He has inherited a sugar addiction and is increasing American debt significantly. If you fancy a quick freak out, have a quick look at the US Debt Clock. US Budget deficit was USD$587billion in Obama’s last year. Last year the gross amount of US government debt to GDP was 105.40%. A 1% interest rate rise increases the proportion of US tax revenue spent on servicing debt to 10.4% of government expenditure. On the current trajectory, US debt servicing costs will be USD$761billion by 2028, potentially making it the second largest expense after social security, surpassing military and defence spending. Currency lever. Significant deflationary impact on USD due to increased supply of government bonds to fund the compounding debt burden. Government Bond Yields. The capacity to service debt will lead to questions about US credit risk. This may then increase the cost of debt funding (i.e. increase the 10-year bond rate), further exacerbating budgetary pressure. It will take even more steam out of the US market. An increase in government bond yields will attract private investors, dampening capital flowing into businesses. If reduced government spending is the pathway to fiscal reform it will mean a deterioration of government services and so a decreased standard of living for the next generation of Americans. If higher taxation is the pathway to fiscal reform it will be an impediment to capital investment and produce a deterioration of US markets. The American public will again suffer. Employment levers. The solution is likely to be a combination of both reduced spending and taxation reform. As a result, there could be a significant ‘brain drain’ as skilled workers find more attractive opportunities abroad (like what happened to Ireland after the GFC). The loss of your productive workforce can have generational impacts. International fixed interest is a tough environment for capital. Careful exposure to floating rate positions with alternative credit protection are the limit of our recommended exposure in this area. Domestic fixed interest. Australia is somewhat more insulated from the risk of inflation and rising interest rates. This is more due to subdued wage growth at present. We note there is rising risk of this changing and we prefer floating rate interest exposures or short-term maturities. Australian equities. Larger ‘bond proxy’ equity positions trading on elevated P/E ratios are at risk of a deterioration in capital value as interest rates rise. Companies with earnings growth that continue to re-invest a substantial proportion of earnings into sustaining business growth, particularly where there is a global market for their product/service remain attractive. Yes, these businesses are also trading on elevated multiples, but at least have the capacity to grow their way back into value in the face of volatility. International equities. US market is looking fully priced and volatility in this market signals for the withdrawal of capital already occurring given the Fed’s expected multiple cash rate rises. EU banks are providing some opportunity as are businesses exposed to the Chinese economy, which is still humming along at a predictable 6%. Outside of Asia, given the elevated valuation ratio’s, a rigorous approach to asset selection is more important than ever. Emerging markets. Debt financing developments in emerging markets are often financed in USD. The performance of this broad asset class can be affected by USD currency fluctuations. In the short-term a rising interest differential might see USD appreciate, dampening returns. That said, it is a big market and with appropriate active investment there are some significant opportunities and we are conscious of longer term US government debt effecting USD valuations. Cash. As Warren Buffet said in his last letter to shareholders, “never risk what you have and need, for what you don’t have and don’t need”. We are happy building up cash positions. Having some cash in a portfolio provides buying opportunities and insulation to downside volatility.